In March, our Central Oregon community voted three deserving local veterans forward (on social media) to our company vote, where Margie Anderson was named the winner of Project Serious. Margie is a veteran who continues to give back to fellow Vets across Central Oregon. The groundswell of support for her during the decision process was overwhelming but then matched by the turnout of community support on her work days. Margie’s home needed a lot of work. She had siding that was failing, a home that needed paint, and a dream of a deck where she could put two rocking chairs. The carpentry prep work and her deck were completed earlier this month. 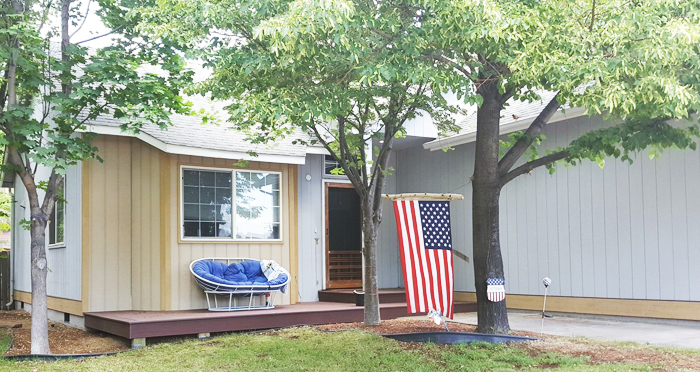 Her exterior paint and finishing touches on June 23 gave Margie the refresh she so deserved and will protect her home for years to come. That’s the Webfoot Way! And what color scheme did she choose? Red, white and blue of course. WEBFOOT PAINTING has provided seriously great painting, carpentry, and deck services throughout Central Oregon since 2003. We offer seriously great service and quality of work—just ask our seriously satisfied customers!